Most people don’t know how beautiful the land is around Las Vegas, so I hope this inspires them to explore the city’s nature. This land art installation will last only so long before it is disassembled. Like a NASA spacecraft, its mission to bring joy has been extended through the end of 2021. Honestly, I never heard of the concept of Land Art before this installation. It also introduced me to instagrammable places. From photos it may be difficult to assess the physical presence and surprise these granite hoodoos manifest on the Jean Dry Lake. From the highway, the sculpture seem small, perhaps the size of aquarium pebbles. They aren’t. The limestone boulders are stacked in to 30 foot towers, about the height of a two-story house. Attention travelers on I-15, Los Angeles to Las Vegas. Be tempted by this multi-colored photo opportunity – touristy without apology, trending in an oh so cool way. Slow travelers, this is the place to stretch your legs and people watch. A parking lot, no toilets, no souvenir replicas. It’s a walk in the beautiful desert. From the highway, look for the installation at Mile 18 on I-15. There is a dirt path from the parking lot to the sculptures. All of the visitors appear to be in jovial moods. No one stays that long. According to Google, the average visit is about 25 minutes. Seven Magic Mountains is 11 miles south of the M resort on South Las Vegas Boulevard. Blue Highway travel meets a kaleidoscope of colors. Check out the #7MagicMountains hashtag on Twitter, Instagram and Flickr to see the attraction/destination. The installation is dog- and drone-friendly. Windy days are dusty days. Avoid going when there are gusts. What should we know about Jean Dry Lake? 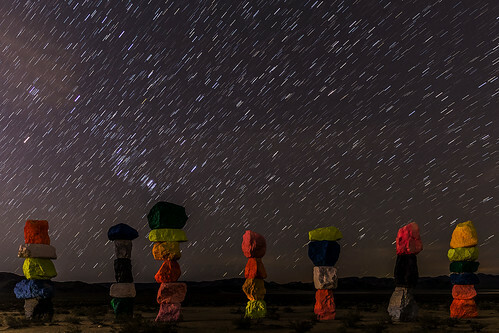 What other monumental outdoor art works are accessible in Nevada? When will the exhibit be removed? 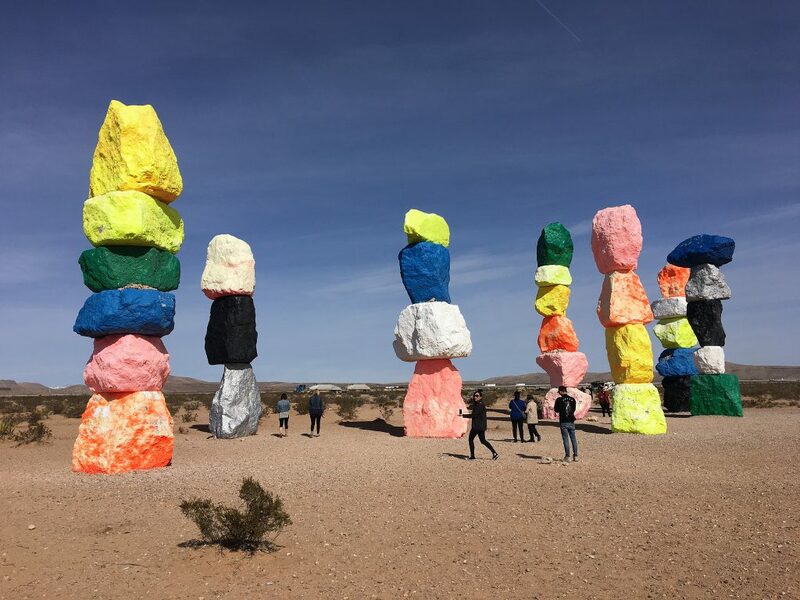 “Renowned Swiss artist Ugo Rondinone’s colorful large-scale, public artwork Seven Magic Mountains is a two-year exhibition located in the desert outside of Las Vegas, Nevada, featuring seven thirty to thirty-five-foot high dayglow totems comprised of painted, locally-sourced limestone boulders.